The Ken-Royce engines are small 5 and 7 cylinder radials of between 70 and 120 horsepower, depending on the model. 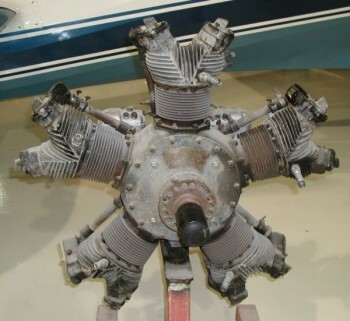 Ken-Royce engines are most commonly seen on Rearwin aircraft, but Ken-Royce engines, and their predecessor line, the LeBlond engines, also powered some other light planes of the 30s. By the end of the 1930s it was obvious that the day of the small radial had passed, replaced by smaller, cheaper, less complicated horizontally opposed "flat" 4 cylinder engines. Here is a Ken-Royce 5G engine. This engine has pressure-lubricated rocker boxes, and is the final development of the line. Earlier models without pressure lubrication have rounded rocker boxes with a vent opening at the front. The older models require manual greasing for rocker arm lubrication, and they often throw out quite a bit of grease during flight. The Monocoupe airframe building company, deprived of an engine builder by Detroit company's bankruptcy, convinced the Velie engine and car company to buy and build Monocoupes, and to clone the Air-Cat engine. The Velie company started building engines in early 1928. Velie made incremental improvements, notably a cast aluminum head. This engine eventually became the Lambert in March 1929. Lambert engines continued to power Monocoupes through the 1930s. The LeBlond company officially bought the Air-Cat design in early 1928, and employed Glenn Angle to improve the engine. LeBlond built engines throughout the 1930s which were installed on numerous types of aircraft. LeBlond is better known as a manufacturer of machinist lathes. The LeBlond line was refined through late 1937. In December 1937, in a deal that sold LeBlond Engines at a huge loss in order to offset a large tax liability from the LeBlond Tool company, the LeBlond engine line was sold to Rae Rearwin of Rearwin Aircraft. This was a natural fit as Rearwin was one of the biggest users of LeBlond engines. Rearwin renamed the engines as "Ken-Royce", after his two sons. A few additional improvements were made in 1938 and 1939 including higher compression and higher horsepower, and pressure lubricated rocker boxes. Production of Ken-Royce engines was halted during WWII and never resumed, as the engine was not economical as compared to newer flat engines. Ken-Royce engine parts were serviced during the 1950s by Air Associates, and in the 1960s the remaining parts stock was sold to the Antique Aircraft Association in Blakesburg, Iowa. There are a few parts left in Iowa, but mostly what's left at Blakesburg are engine drawings. Bellanca Cruisair Jr (5 cylinder) - very rare. Aeronca LB (5 cylinder) - very rare. LeBlond 5D 5 60 Iron heads. LeBlond 5DE 5 70 Iron heads, two bearings. LeBlond 5DF 5 85 Aluminum heads, three bearing engine. LeBlond and Ken-Royce 5F 5 90 Three bearing engine, last of the greasers. Ken-Royce 5G 5 90 Pressure lubricated rockers. LeBlond 7D 7 90 Iron heads. LeBlond 7DF 7 110 Aluminum heads. LeBlond 7F 7 110 Aluminum heads, three bearing engine. Ken-Royce 7F 7 120 Higher compression, improved carburetion. Ken-Royce 7G 7 120 Pressure lubricated rockers. One immediately noticeable feature of the Ken-Royce is that the front case has a "cover". This cover mates with the front of a unitary engine case and is held on with studs and nuts. The front cover plate contains the front radial and thrust bearings, and an oil slinger. This construction contrasts with most other smaller radial engines, where the case splits fore-aft along the centreline of the cylinder bosses. The advantage of the cover construction is that by removing the front cover and undoing master rod and link rods, it is possible to remove the crankshaft with removing any of the cylinders. There are many interchangeable parts between the 5 and 7 cylinder models of the Ken-Royce and LeBlond engines. Reusable parts include the cylinder assemblies, gearcase, and oil pump. The engine is modular in design. The gearcase can be removed intact, and the oil pump is a single unit that can be dropped out the bottom of the gear case for overhaul or replacement. The Stromberg NAR-3 carburettor contains a built-in "primer". It acts like a choke, leaking gas into the intake stream when activated, in order to prime the engine. The valve springs on LeBlonds and Ken-Royce engines are "volute" springs wound in a beehive shape out of strip steel, unlike most engines which have nested coil springs wound from round wire. This type of spring was a feature inherited from the Air-Cat, and the story is that at the time of the Air-Cat design in the late twenties, round wire springs had resonance and fatigue problems. The volute design eliminated the resonance and lasted longer. Charles Lindbergh's transatlantic flight in 1927 increased interest in aviation and the Air Commerce Act of 1926 established a government certification program of pilots and aircraft giving the industry safety and legitimacy. Rearwin Airplanes was founded by Raymond Andrew "Rae" Rearwin in 1928. Employing his two sons, Royce and Ken, the small company designed and built over 400 airplanes. 1928: R A Rearwin founds Rearwin Airplanes Inc.
1937: Rearwin Airplanes acquires LeBlond Aircraft Co and renames the engine manufacturer Ken-Royce Motors. 1939: The company re-names itself Rearwin Aircraft and Engines Inc.
1942: Rearwin is sold to the Empire Ordnance Company and the name of the company is changed to Commonwealth Aircraft. 1946: Commonwealth Aircraft goes out of business.